Being Masters week, PAX took part in a 9-“hole” workout. 4 cones were spaced in the parking lot at ~85, 110, 150, and 175 yards from the “tee”. 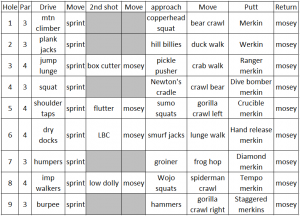 Exercises were done per the table below, all done as 18 reps- some IC, some single-count. For a par 3, hit the “approach” at cone 1 by doing the second exercise, “move” to cone 2 by doing the crawl listed below, “putt” at cone 2 by doing the merkin listed below. For a par 4, hit the “2nd shot” at cone 1 by doing that second exercise, moseyed to cone 3, hit the “approach” at cone 3 by doing the second exercise, “move” to cone 4 by doing the crawl listed below, “putt” at cone 4 by doing the merkin listed below. OK, that sounds confusing even to me. Pic below to explain. After the “putt”, we moseyed back to the tee for the next hole. We did get all 9 holes in but had to cut the final burpees and merkins a little short and skip the Mary. Great effort by all. COT– Bulldog took us out.